When it comes to convert .eml files, the EML Viewer Pro email reader provides a tremendous amount of flexibility to it’s users through Export Profiles. It is best to think of export profiles as editable instruction sets that tell EML Viewer Pro how it should perform the conversion and exportation of selected email messages. EML Viewer Pro ships with more than 25 pre-configured export profiles. Any of these profiles can be edited to your specific needs, or you can build completely new export profiles. If you don’t yet have EML Viewer Pro installed on your Windows computer, you can download a free trial from the EML Viewer Pro home page and follow along with this lesson. Export profiles are easy accessible from the EML Viewer Pro (also known as Pst Viewer Pro) software main toolbar. Individual profiles are selected from the drop down list. To use an export profile, first find the messages you want to export in the Mail List, click “Ctrl-A” to select all emails, choose your export profile and then click the start button. To create a custom export profile, start by clicking the ‘Create New Profile’ button from the EML Viewer Pro toolbar. This will run the Export Wizard, which will walk you through the simple steps of creating a basic export profile. In the first step, enter a name for your profile. You may want to give it a name that is meaningful so that you’ll recognize it from the profile drop down list. In our example today, I’m going to give it the name “My New Profile,” and choose a PDF target format. Click next to advance the wizard. In step 2, you can select a specific folder to export messages to, or you can tell EML Viewer Pro to always put the files it creates into a zip archive. Click the finish button to complete the wizard. When the wizard has completed, look at the export profile drop down list. You should see your new profile listed. Just for fun, let’s edit this profile and make some deeper changes to it. First, select your new profile from the drop down list, and then click the “Edit” button. The Edit Button is the icon that looks like a piece of paper with a pencil. The Export Profile Editor will launch. Here is where you can change all of the settings for the selected profile, from its name to it’s format. Let’s examine some of the options that we can select from. There are about 30 different pre-configured page sizes that you can export to. Page size will impact the page size of printing or PDF exports. Page sizes can be specific to an export profile. You can also specify a custom page width and height, as well as the orientation (landscape or portrait). A setting for ISO 190005-1 PDF/A is also included in this area; use PDF/A when you want to archive .eml files for long term preservation. 30 different page sizes are available. Eml Viewer Pro provides options for grouping and naming the exported files. While exporting to PDF, you can tell EML Viewer Pro to export emails into one large single pdf file, or into separate pdf files. Each exported file that EML Viewer Pro creates may be given a name that is based on your custom scheme. For example, you can place parts of the email content into the file name, such as the sender, the date received, or even an incremented number. To customize file naming, click on the expansion button on the “File naming schema” field to open the editor, and arrange the naming plan in the manner that is best suited to your project. There are many other settings you can use in the Export Profile Editor. We encourage you to experiment with all of the different ways that EML Viewer Pro’s settings can be combined to create flexible and efficient approaches to your project. EmlViewer Pro costs $69.99 for a perpetual license. Files with the .eml extension are RFC-822 formatted email messages. EML Viewer Pro is a tool for managing eml files, and converting them to different formats, including image files like PNG, GIF, TIF and BMP. Today’s tutorial will show you how to use EML Viewer Pro to convert a html email message into a PNG file. Download and install the 15 day free trial of EML Viewer Pro so you can follow along. EML Viewer Pro can display your .eml and .msg email files in a list. It’s easy to scroll through this list and browse your emails. 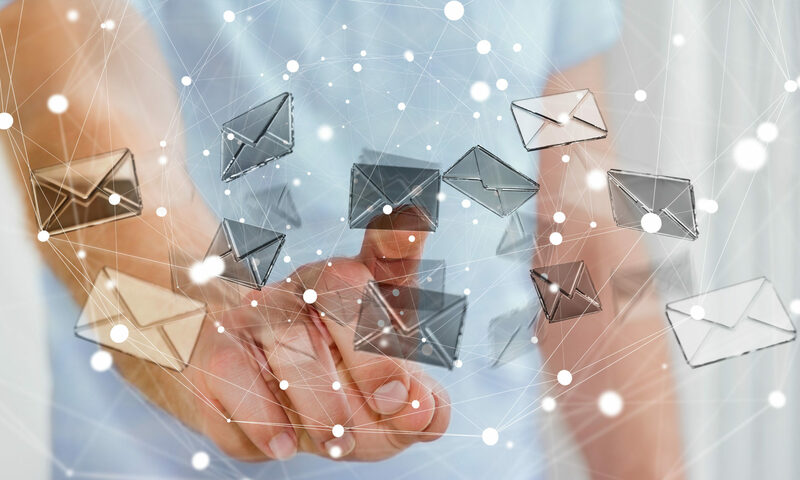 You can also search your emails and display those that meet your specified criteria, such as a date range, from a certain sender, or emails that match a search query. In our example, I have a html formatted .eml file that contains an advertisement from a computer sales company. Selecting the message from EML Viewer Pro’s message list causes the email to display. To export this message to PNG format, I simply select the PNG export file from the drop down list in the toolbar. It is possible to select many .eml files for conversion (type Ctrol-A to select all emails in the list). To start the export operation from eml to png, I click the export button. The export button is the green down arrow that points to a yellow stack of paper (I drew a red arrow pointing to it in the above image). The export operation will begin, and the email is formatted into a png file. The size of the png image file will vary with the length of the email. In this example, you can see that the resulting PNG is quite long. EML Viewer Pro has preserved the images and html formatting. 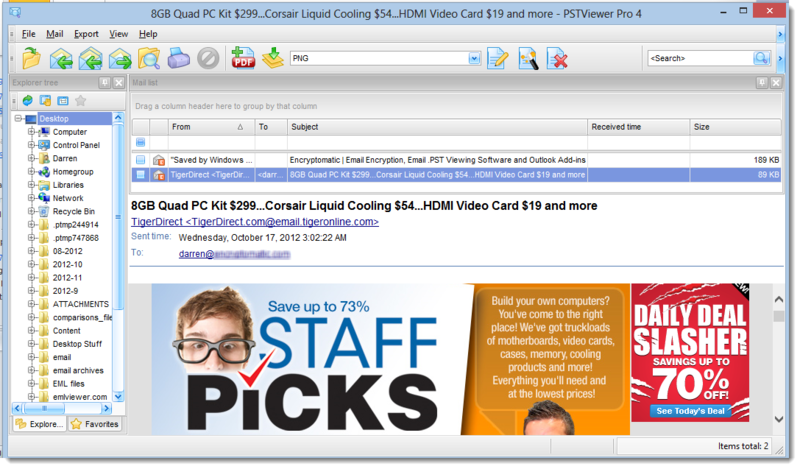 The email header information is included in the top of the image. 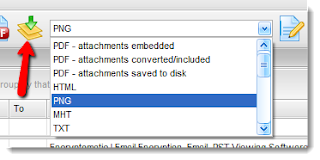 Converting EML email files to PNG or other images are a good way to preserve emails for sharing or archiving. 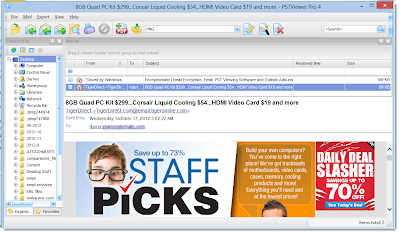 Because many html formatted emails have images that are hosted remotely, the contents of the email are not downloaded until the email is displayed. Saving the html email as a png file preserves a copy of the original message, and is not dependent upon the availability of a remote server. EML Viewer Pro is a versatile tool that helps you transform your emails into many different formats. In addition to PNG, you can also format emails to pdf, csv (Excel), html, mhtml, and others. Download a free trial today and see what EML Viewer Pro can do for you.